MFA, has taught courses on social justice poetry, literary communities of Los Angeles, and literary submission strategies at Antioch University, Inspiration2Publication, and PEN Center USA. 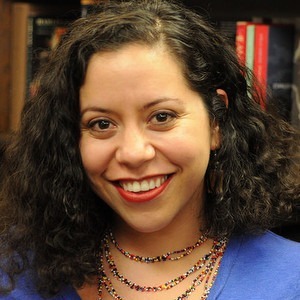 Her activism and writing has focused on immigrant rights culminating in her debut poetry collection, Posada: Offerings of Witness and Refuge (Sundress Publications, 2016), which recounts her time volunteering with the Tucson-based human rights organization No More Deaths/No Mas Muertos. Her work is published in Acentos Review, CALYX, crazyhorse, and The James Franco Review among others. As a writer, I seek to inspire radical empathy in myself and in my readers. In today’s world, I believe writing and reading is one of our strongest forms of resistance. To ask others to look beyond their own biases and understandings of the world through writing and reading, to ask others to be brave enough to open themselves to others’ experiences is what we need right now. As a writing teacher, I look for readings and poems that will spark conversation in class and lead to exercises and experimentations that help students find their own voice and own strategies for writing for social change. I do not believe I have the answers. I am not a lecturer. I am a practical learner, and I conduct class much in the way I like to learn, through open discussion, collective knowledge, experimentation, and practice.